Visitors are banned from nine hospitals in the north-east of England in order to contain a norovirus outbreak. Nearly 200 patients and NHS staff in Northumberland and North Tyneside have been affected by the highly infectious bug, which causes vomiting, diarrhoea, stomach cramps and fever. Only patients receiving end-of-life care may have visitors. Northumbria Healthcare NHS Foundation Trust said it would "allow as much access as is safe". "We know it's Christmas and are doing everything we can," a spokesperson said. "We are hugely grateful for the support our staff have received from the public and ask that this understanding continues." The cause of the outbreak has been traced to a visitor bringing in mussels for an inpatient at Wansbeck General Hospital in Ashington, the trust said. Shellfish can carry the norovirus infection. Visitor restrictions would be partially lifted between 14:00 to 15:00 GMT on Saturday, but only for unaffected wards, the trust said. However, this arrangement could change. Full restrictions will remain in place on affected wards at all times. 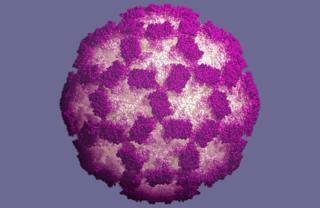 Norovirus is very infectious and easily spread before symptoms appear. While it usually lasts 48 hours and has no long-term effects, it can be "extremely debilitating" for patients already unwell and in hospital. Permitted visitors should wash hands thoroughly with soap and water, not alcohol gel, and not visit if they have symptoms, the trust said. Outpatient appointments are unaffected by the ban and restrictions will be reviewed daily.